The objective of the AFRL Propulsion Directorate's HyTech [Hypersonic Technology] program is to demonstrate the operability, performance, and structural durability of a liquid hydrocarbon (jet fuel) supersonic combustion ramjet (Scramjet). The near term application of this technology is a long range hypersonic cruise missile that is logistically supportable in a combat environment and can defeat time-sensitive targets and hard and deeply buried targets. 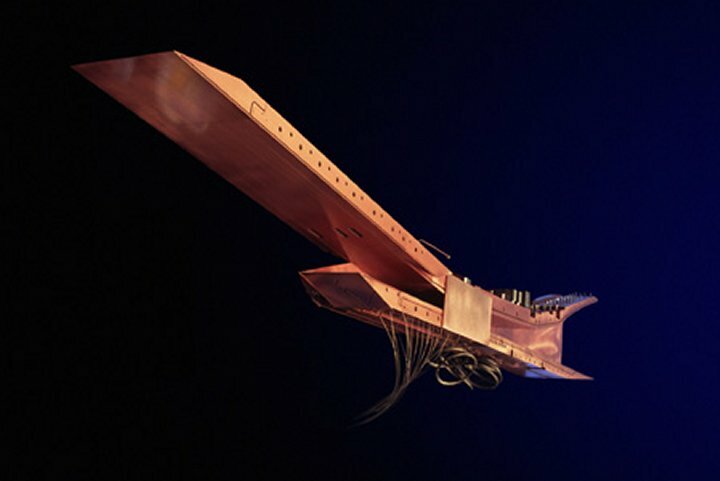 In the far term, the scramjet technology enables a Mach 8-10 strike/reconnaissance aircraft and affordable, on-demand access to space with aircraft like operations. The HyTech program is the latest in a long series of Air Force efforts to prove the viability and utility of the supersonic combustion ramjet engine. The program is focused to establish a scramjet technology base with near term applications to hypersonic cruise missiles. This technology base can be expanded to include reusable hypersonic vehicles such as strike/reconnaissance and affordable access to space vehicles. 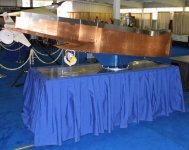 The US Air Force established the HyTech Program in 1995 to maintain an aggressive technology development program in hypersonics after the National Aero-Space Plane's development was terminated. In 1996, P&W won a $48-million contract for HySET. 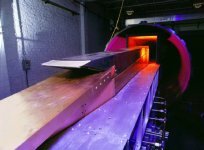 By maturing scramjet propulsion, researchers will provide a key component to a new breed of propulsion systems known as the combined or combination cycle engines. These combine turbine, ramjet, scramjet and/or rocket engines, using each of the different cycles to the fullest advantage of their respective efficiencies to optimize overall system performance. Such propulsion systems have the potential to enable a family of vehicles, including global range, high speed aircraft, and "spaceplane" type vehicles for on-demand access to space. As a variation of the ramjet, scramjets allow combustion to occur in a supersonic airflow, therefore eliminating the physical flow throttling characteristic of a conventional ramjet and expanding the operating range above Mach 6. Scientists realized during early experiments that evolving the well-known ramjet to a supersonic combustion engine was a challenging and complex task. In the ensuing years, scientists conducted several programs in the US with the objective of proving the scramjet as a viable propulsion system; however, none advanced to the flight test stage. In 2001 a team of researchers from Air Force and industry achieved a major milestone on the development path to demonstrate a hydrocarbon-fueled, supersonic combustion ramjet, or scramjet, engine. Such propulsive power will enable weapons that will dramatically increase range and decrease the reaction time when employed against high-value targets at long standoff ranges. The supersonic combustion ramjet (scramjet) engine, developed by Pratt & Whitney under the Propulsion Directorate's Hypersonic Technology program, known as the performance test engine (PTE), is a heat sink, hydrocarbon-fueled scramjet engine demonstrator. In January 2001, the PTE made history when it became the first integrated scramjet engine to successfully operate at hypersonic speeds using conventional hydrocarbon fuels without the use of energetic additives. During the history-making test program, directorate engineers verified performance and operability of the engine in the Mach 4.5 to 6.5 flight regime. The first key technology addressed was the slim thrust-to-drag margins inherent in supersonic combustion flow paths. Traditional methods of fuel/air mixing rely on physical protrusion into the flow such as a fuel strut. Frictional drag and structural cooling requirements increase as a result. HyTech scientists successfully minimized physical intrusions into the flow path to widen the thrust-to-drag margin. The PTE recorded net positive thrust and demonstrated good fuel/air mixing. The second groundbreaking technology was development of fuel-cooled structures using endothermic fuels. Scientists designed the HyTech engine to run on JP-7 fuel to take advantage of hydrocarbon fuel volumetric energy density and its logistics availability. In the PTE, they simulated structural heating of JP-7 in a bench fuel heat exchanger/cracker. The heat exchanger delivered heated JP-7, or its cracked endothermic products, to the engine fuel injectors. The engine operated successfully at each test Mach number with the fuel in the appropriate thermodynamic state and composition. Further, scientists developed and demonstrated large-scale, fuel-cooled panels using nickel-based alloys. They tested these panels in a scramjet combustor at UTRC and in the Air Vehicles Directorate's Radiant Heating Facility. These components exceeded engine durability requirements. A third success factor for the HyTech demonstration was limiting the target operating range of the engine to between Mach 4 and 8, a regime well suited for hydrocarbon operation. This allows scientists to design a fixed geometry engine, simplifying the structure and operation. Built under the AFRL's Propulsion Directorate's HyTech program, the Performance Test Engine, or PTE, successfully completed a series of free jet tests at Mach 4.5 and 6.5. The PTE is an integrated engine with inlet, combustor, and nozzle. Pratt & Whitney developed this heavyweight, heat sink demonstrator engine under contract to AFRL. The tests were conducted at the GASL facilities at Ronkonkoma, New York. The PTE met or exceeded performance goals. The Performance Test Engine (PTE) garnered a 2001 Aviation Week Laureate Award for the scramjet development team. The next step and culmination of the HyTech program was the flightweight Ground Demonstration Engine. This integrated scramjet engine will be fabricated with fuel-cooled structures that will demonstrate the performance, operation, and structural durability of this flight-type test engine. To develop the GDE design, the Hydrocarbon Scramjet Engine Technology (HySET) team used a building-block approach that began with computational fluid dynamic codes. The world-class hypersonic codes define combustion products while optimizing the fueling locations and concentrations required for top performance. Computational results are used to refine engine lines, allowing optimization of the engine design prior to test. Testing of the Ground Demonstration Engine (GDE) under the Propulsion Directorate's Hypersonic Technology (HyTech) Program commenced on 6 September 2002. The GDE is a flightweight hydrocarbonfueled scramjet (supersonic combustion ramjet) engine demonstrator being developed by Pratt & Whitney under sponsorship of PR's Aerospace Propulsion Office (AFRL/PRA). GDE testing was performed at the facilities of the GASL Division of Allied Aerospace Industries, Inc in Ronkonkoma, New York. Testing of the fuel-cooled GDE moved beyond the PTE tests by demonstrating, for the first time ever, performance and structural durability of a flightweight hydrocarbon-fueled scramjet operating from Mach 4.5 to 6.5. Although the scramjet engine under development is sized for a tactical missile, the technologies being investigated have widespread applicability to high-speed airbreathing propulsion research. The maturation of high speed airbreathing propulsion technology is a critical step in the development of combined cycle engines that will enable more cost effective, on-demand access to space for future systems. During numerous runs at Mach 4.5 and Mach 6.5 (September 2002 through June 2003), this ground demonstrator engine, known as GDE-1, reliably produced significant net positive thrust, which is important because it demonstrated the ability to efficiently burn fuel and accelerate a vehicle at these speeds. The thermal characteristics and structural durability of the engine were validated at both speeds. 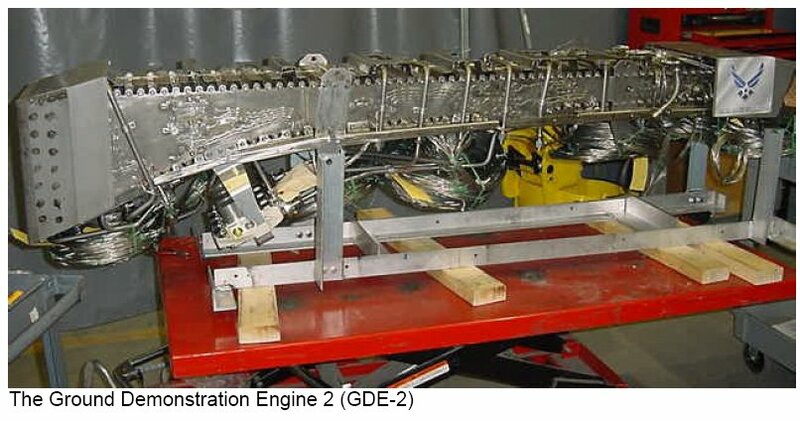 By late 2003 the Propulsion Directorate completed freejet testing of the first generation Ground Demonstration Engine (GDE-1) as part of the Aerospace Propulsion Division's Hypersonic Technology program. GDE-1 is a flight-weight, fuel-cooled, hydrocarbon supersonic combustion ramjet (scramjet) ground test engine designed and built by Pratt & Whitney and tested at GASL's facilities in Ronkonkoma, New York. Directorate researchers teamed with these industrial partners to successfully demonstrate the operability and durability of the GDE-1 at two representative flight Mach numbers (M = 4.5 and M = 6.5). Notably, this was the world's first fuel-cooled scramjet engine to operate on conventional jet fuel. 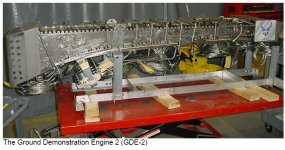 Having successfully completed GDE-1 testing, the next step in the development process was to design, fabricate, and test the second generation Ground Demonstration Engine known as GDE-2. By early 2005 Smiths Aerospace of Manchester, Connecticut, completed fabrication of the 2nd generation Ground Demonstration Engine, or GDE-2. This scramjet engine was assembled under the Propulsion Directorate's Hydrocarbon Scramjet Engine Technology (HySET) program with Pratt & Whitney. Using lessons learned from GDE-1, GDE-2 was designed and fabricated to demonstrate the operability, structural durability, and engine performance of a complete hydrocarbon-fueled scramjet propulsion system to be tested at Mach 5 and Mach 7. In July 2005 Pratt & Whitney (P&W) Space Propulsion completed fabrication of a hypersonic Ground Demonstration Engine (GDE-2), successfully completing a three-phase, nine-year, $58 million contract with the U.S. Air Force Research Laboratory (AFRL). The engine has a single flight-like flowpath with a bolted assembly, composite leading edge, closed-loop fuel system, and moveable inlet cowl flap. The engine was integrated with the forebody, pedestal, and instrumentation. 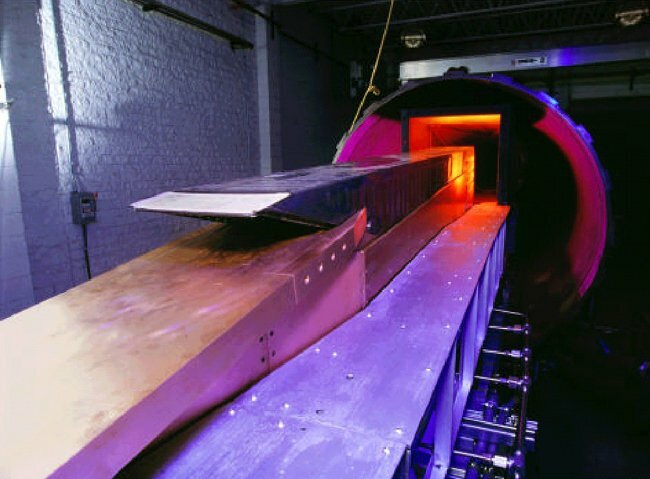 It was then shipped to NASA Langley Research Center (LaRC) in Hampton, Virginia, to be tested in the NASA LaRC 8-foot High Temperature Tunnel in October 2005 at Mach 5 flight conditions. Major test objectives were to demonstrate the closed loop fuel system, assess inlet performance and operability, assess operational characteristics of the hot gas valves, confirm engine light sequence, and verify design tools. This was the first time a hydrocarbon-fueled scramjet propulsion system, which includes a single integrated flow path, fuel control system, closed-loop thermal management system and a Full Authority Digital Engine Control, was tested at hypersonic conditions.